The first aerial crossing of the English Channel took place from Dover on 7 January 1785 by Dr. John Jeffries (1744–1819) and Jean-Pierre Blanchard, (1753–1809) using a balloon. By the end of the 19th century, balloons were becoming larger and in 1900, the first Zeppelin had flown. In Europe, free ballooning was flourishing in the vanguard of which was the Aéro-Club de France, founded in 1898 and based in Paris. Two years later the Aero Club (now Royal) opened in London. In 1804, a British amateur engineer, Sir George Cayley (1773-1857), flew a model glider, the world’s earliest known successful heavier-than-air craft. In 1853, his full-sized glider made the world’s first manned heavier-than-air flight. Between 1891 and 1896 Otto Lilienthal (1848-1896) using gliders made by himself, flew over 2,000 controlled flights. Sadly, he died of injuries when he fell from a craft that had stalled. 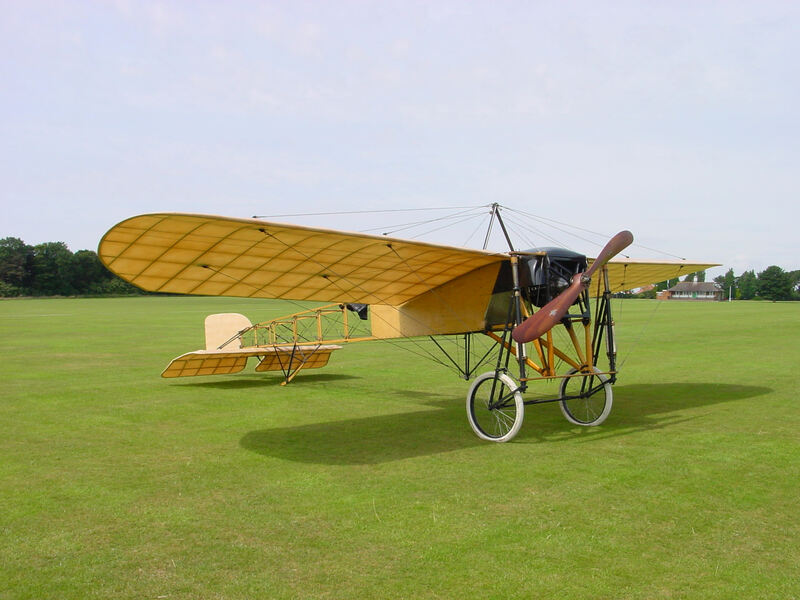 In the US, bicycle manufacturers, Wilbur (1867-1912) and Orville Wright (1871-1948) inspired by Lilienthal’s work, made a fabric-covered wooden bi-plane. This was driven by a petrol engine and on 17 December 1903, the Wright brother’s made the worlds first powered controlled sustained flight – it lasted 59 seconds. By 1905, the brothers had built a flying machine with controls that was completely manoeuvrable. In 1904, French Captain Ferdinand Ferber (1862-1909), refined the Wright’s earlier aircraft by adding a stabilising fixed tail-plane. What was happening in the US spectacularly revived heavier than air flights in Europe, especially in France. There, Louis Blériot, (1872-1936), designed a monoplane that managed to fly a distance of 17 miles from Toury to Ateny, on 31 October 1908, making two landings en-route and setting a record for distance flown. Two weeks before, 16 October, a former American cowboy, Samuel Cody (1867-1913), made the first powered flight in the British Isles. Together, these two events led the Daily Mail to offer a £1,000 prize to the first person to cross the English Channel in a heavier-than-air machine. The summer of 1909 saw two serious contenders, Louis Blériot and Hubert Latham (1883-1912), both waiting in France for unseasonable windy weather to abate. 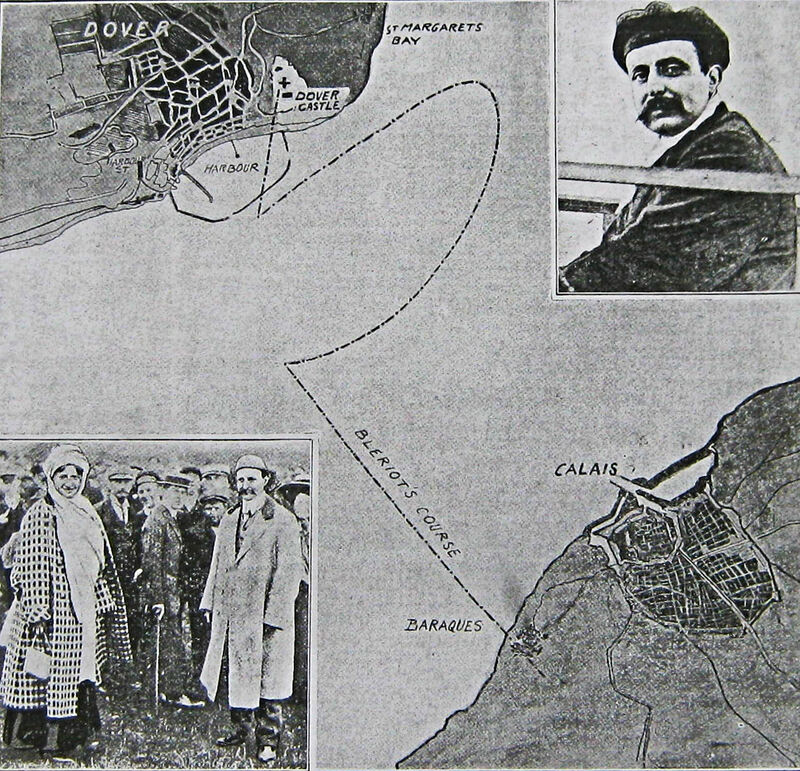 Blériot had sustained nasty burns to his foot on a previous flight but at about 02.30hrs on the morning of Sunday 25 July, he was driven to Barraques, near Sangatte. There made a short flight in his Blériot No XI 25-horsepower monoplane. The machine was made of ash and poplar and strengthened with piano wires. The controlled parts were the wings, the elevator that took the place of a tail and a rudder that also acted as a balancing fin. It had a Chauviere modele integrale propeller and the engine was a 3 cylinder Anzani – designed for a motorbike. Dawn was breaking but it was still quite windy when at 04.41hrs, Blériot set off. One of his aides sent a signal to the Lord Warden Hotel, in Dover’s Pier District, where reporters from the Daily Mail were staying. Blériot wife, Alice, was on board the French destroyer Escopette that was to follow Blériot across the Channel and, if there were an accident, rescue him. Popular myth says that while over the Channel a shower of rain cooled the overheated engine, this is not true. Nonetheless, the historic trip was not without incident. About half way across the Strait, Blériot ran into a bank of cloud. Although he did have a compass on board the wind blew him off-course to the east. When the cloud cleared, he saw what he believed to be the South Foreland and followed the coast west to the pre-determined landing site at Northfall Meadow – 300 metres northeast of Dover’s Castle. This spot had been chosen by one of Blériot’s aides as the cliffs are relatively low and the engine was too weak to bank and climb far. He landed 36 minutes 30 seconds after takeoff, travelled at an average speed of 42mph at an altitude of 250ft (approximately 80metres). Due to gusty wind conditions, Blériot had switched the engine off before landing and so bumped to earth. This caused damage to the undercarriage and shattering a propeller blade. There were two French journalists, one of whom had been primed to fly the Tricolour from the chosen landing spot to greet him. V Ker Seymer – a Royal Aero Club official – was on site to verify the flight, Police Constable John Stanford and a few soldiers, who were on duty at the time, were there to meet him. It had been expected that Latham would be the first to land, as his plane was stronger and his publicity machine much better. Indeed, so sure that Latham would be the first to make the crossing, the media circus was at the proposed Latham landing spot at Aycliffe. 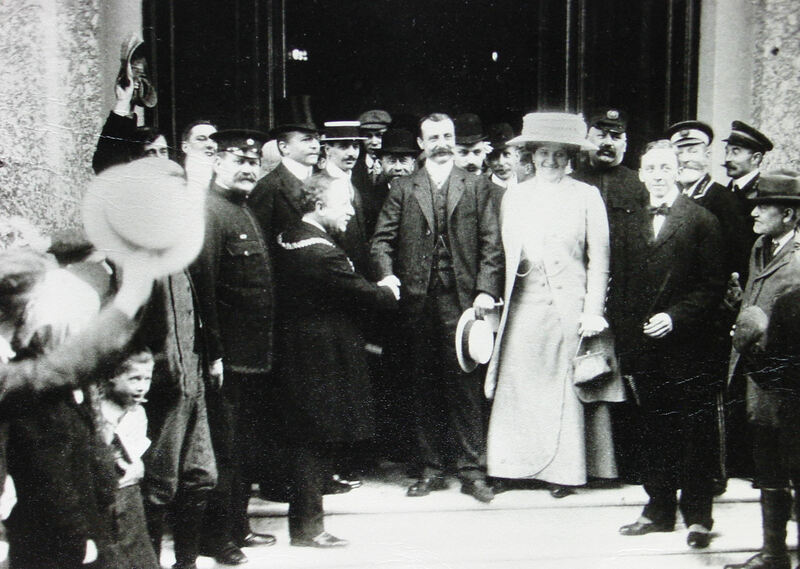 Although the British customs were not actually waiting when Blériot landed, they arrived only minutes after Blériot had touched down. However, they were flummoxed as to which category they should register the monoplane; eventually they decided it was a yacht! News of the feat quickly spread and as people arrived, Blériot became concerned to protect his craft. Amongst those present was Eddy King, the owner of the Dover Marquee Company. 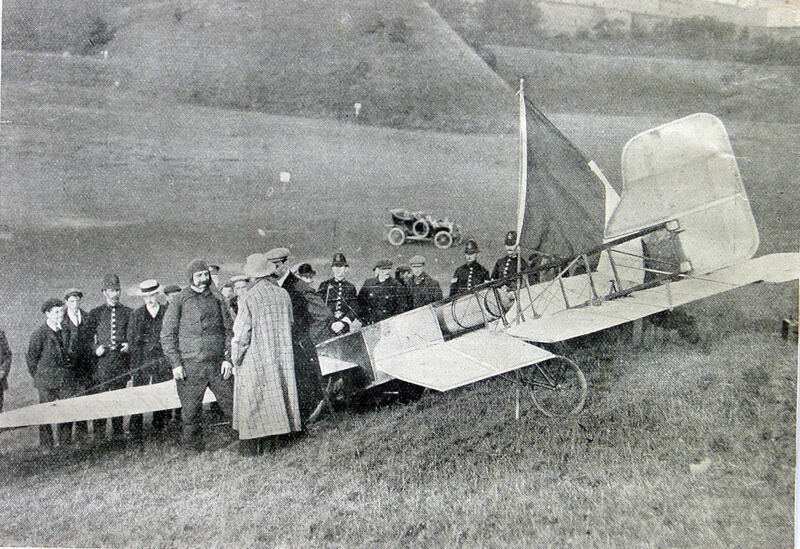 He quickly organised a protective cover and visitors were charged 6d to look at the Blériot No XI. £60 was collected that day and given to charity. The next day Dover’s Mayor, Walter Emden, in honour of Louis and Alice Blériot, gave a grand civic luncheon at the Lord Warden Hotel. A granite memorial on Northfall Meadow was laid, in 1910. As a guide to the shape and size the imprint made by the crowds that came to see the plane was used. Alexander Duckham (1877-1945) of Duckhams Oil, who was involved in the building of the Admiralty Harbour at the time, paid for the Monument. The granite is believed to belong to the same batches as used in the construction of the harbour! During all the hype and celebrations Gordon Selfridge, proprietor of the great department store, was motoring around Kent. 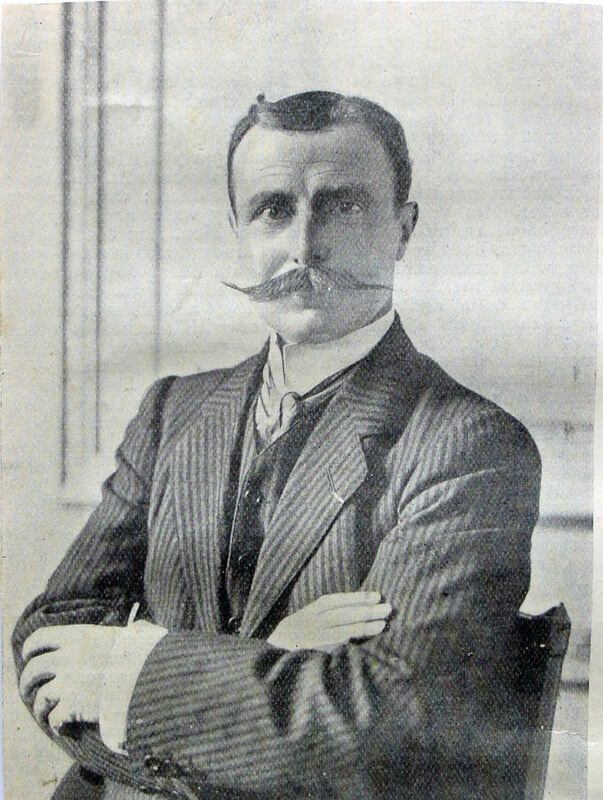 On hearing of the historic flight, he made an appointment to see Blériot and persuaded the pioneer to exhibit his craft at his Oxford Street department store. Following the exhibition, the plane was returned to Paris. The achievement brought not only fame for Blériot but also it changed people’s attitude towards flying. Orders came in for planes from the Blériot’s factory and by the end of the year, he had orders for over 100 aircraft. He continued to design and produce aircraft and his business expanded accordingly, producing fighter aircraft during World War I (1914-1918). Following the War, he briefly produced both aircraft and cars in the UK. In 1927, Blériot welcomed Charles Lindbergh in Paris, after the latter had successfully flown across the Atlantic. 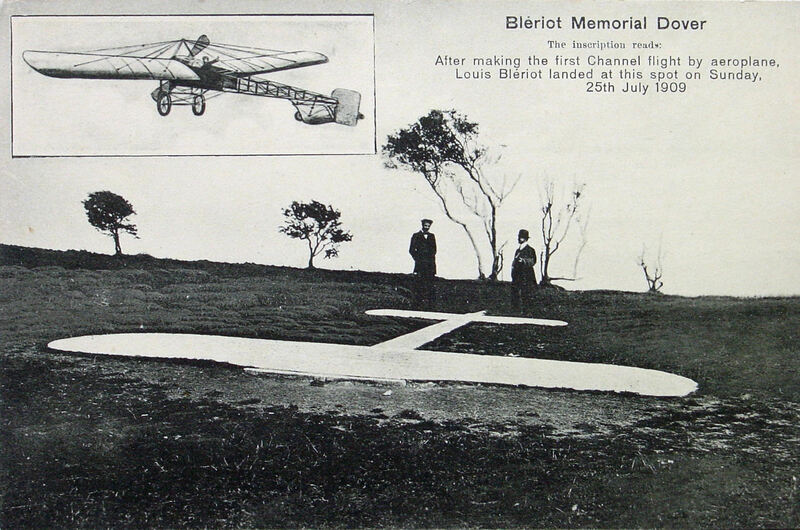 Blériot died on 1 August 1936, was given full military honours and is buried in Versailles. For the 1965 film comedy, ‘Those Magnificent Men in their Flying Machines’ partly filmed in Dover; a replica of the Blériot No XI was made. For film purposes, it was adapted with two seats and a modern engine. In 1984 Patrick Lindsay flew this plane across the Channel following which the wife of the then Chairman of Dover District Council, Sheila Buss, went for a flight! 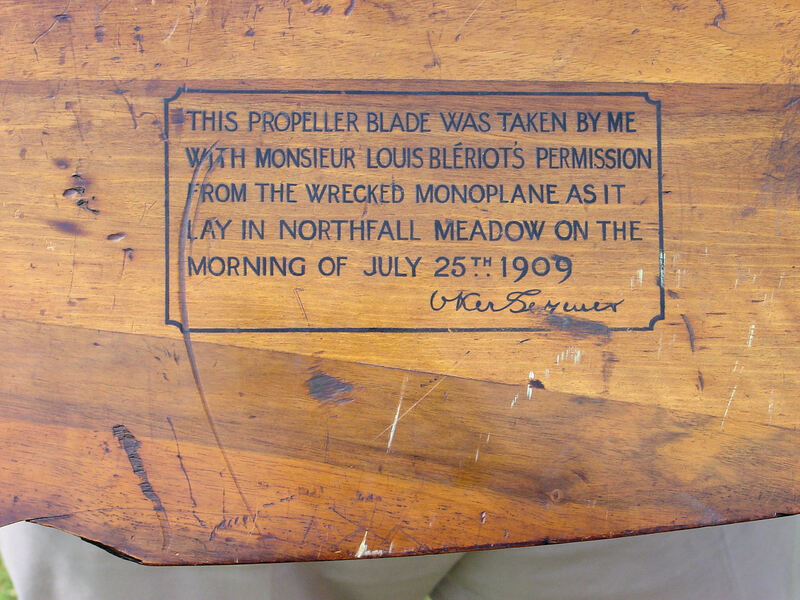 Original blade from the Blériot No XI plane authenticated by V Ker-Seymer, the Royal Aero Club official who was on site to verify the flight! Finally, on 25 July 2009, the centenary of the original Channel crossing was celebrated by an exact replica of the Blériot monoplane, flown by Frenchman Edmond Salis making the crossing. He landed at the Duke of York’s Royal Military School, not far from Northfall Meadow. In attendance was David Roberts, Chairman of the Royal Aero Club of the UK who brought with him the original propeller, belonging to the Royal Aero Club, from the 1909 aeroplane. It had been presented to the Aero Club by V Ker-Seymer, the Royal Aero Club official who was on site to verify the flight! This entry was posted in Aviation, Blériot Louis - The first person fly across the Channel in a heavier-than-air craft, Blériot Louis - The first person fly across the Channel in a heavier-than-air craft, People. Bookmark the permalink.